Thinking About A Website Redesign? Turns out there is a lot of website redesigning going on. We really enjoyed HubSpot’s Mike Volpe’s presentation on the science of website redesign yesterday. Today, I am sharing a few take aways and my thoughts from the webinar. 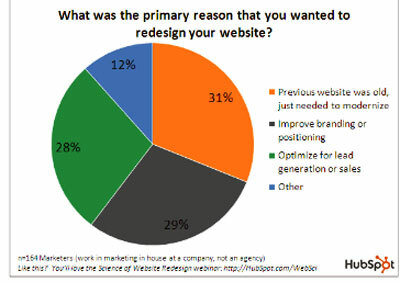 The reasons that people redesign their websites were varied. However the most sited reason was to modernize the site. No reasons were given for the need to modernize. The businesses that we talk to often need to modernize because their site is not visable across all browsers or not mobile friendly. Another reason businesses want to redesign is to put their site in a content management system (CMS) so they can make changes themselves. Another key take away was that consumers don’t really care about your design. Consumers want to be able to find the information they are looking for easily! That means that a lot of consideration must be given to the navigation of the site. Our rule of thumb is to keep the number of clicks required to get to a page to no more than 2 (and preferably only 1). The study also found that most people advise a redesign every 1 to 2 years. However, consumers preferred that sites they visit be redesigned more often. I think this is because consumers crave new information. When consumers visit sites, looking for information, they want the freshest, most up to date information available. In this case, a complete redesign may not be what is necessary. Businesses that keep content up to date are the ones that are pleasing the consumer. Of course, as we have stated many times, a blog is the best, most effective way to continually add fresh content to your site. These points are often overlooked by web designers. In a recent live seminar that I attended, attendees were told that after a redesign, their traffic would initially drop but would pick back up within 6 month. This happens when businesses and web designers don’t measure the assets of the current website and protect them going forward. Assets can be protected by preserving content that is working and creating redirects from old URL’s to new URL’s to preserve the SEO. The study found that businesses that had a clear goal for the redesign and measured before and after were the happiest with their redesign. Thanks to HubSpot for another great webinar full of really useful information. HubSpot is always on the bleeding edge (they have passed the cutting edge). That is why we are Certified HubSpot Partners! Today I’m going to talk about the “Convert” part of that process. Many internet marketers spend all of their time in the Get Found step. And while it is important to get qualified visitors to your site, it is just as important what you do with them once they are there. Clients say to us all the time, “if I can get them to my site, they’ll buy.” This may be true for some, but not all, products and services. Most business owners think that their Sales Funnel is shorter than it is. For those who don’t know, the length of your sales funnel is the time between when a potential customer has first contact with your company to when that potential customer becomes a customer. Usually, the higher the price of a product or service, the longer the sales funnel. With HubSpot, you draw potential customers into your sales funnel by using “offers”. The HubSpot software helps you create buttons and landing pages for your offers. Offers can be anything from the downloading of a free eBook or White Paper to a free 30 minute Consultation or Demo. The free downloads are called “top of the funnel” offers. These are offers that are made early in the sales process. For these offers, you require that the potential customer give you minimal information such as a name and email address. The free consultation or demo offers are called “bottom of the funnel” offers. Potential customers usually accept these offers when they are close to making a purchase decision. For these offers, you require more information such as a telephone number along with the name and email address. Once a potential customer accepts any of your offers, they become a lead. The HubSpot software then helps you track and nurture that lead until they become a customer or leave the funnel. HubSpot can also integrate with SalesForce.com and other CRMs. The HubSpot system is all about converting website visitors into leads and then those leads into customers. What are you doing to convert your visitors? Sequoia Capital has a long history of partnering with founders to help them build long-term, multi-billion dollar companies, including Google, LinkedIn, AdMob, YouTube, Yahoo!, Apple, and Oracle. “We back companies that are transforming their industries,” said Jim Goetz, General Partner at Sequoia Capital. HubSpot is transforming the internet marketing industry. We use the methodology and the software ourselves, and it has literally transformed our business. We used to offer website design and SEO. Now, we have tools to help businesses grow in a very meaningful way to meet their goals, and we can measure ROI. What we do still includes website design and SEO, but it is soooo much more. We didn’t have to become Certified Partners to work with HubSpot. We could have been resellers (VARs) who also used the software. However, we took the additional step of getting the training and passing the certification exam because we wanted to be actual partners with a company that is transforming its industry and helping businesses that are serious about growing and reaching their marketing goals. I even took an additional step to become a HubSpot Certified Educator. Now, not only do I use the inbound marketing methodology, I teach it to others as well as use it to help our customers. By the way, this same methodology is now being taught at Harvard Business School. What are your marketing goals? Are you serious about growing your business? If you are committed to growing, we can help by partnering with you and committing to help you grow. As I begin to write this post today, my heart goes out to our friends to the Northwest of here in Joplin, Missouri, who have been so devastated by a tornado last night. I see there is a Facebook page set up to provide information for those that would like to help at Joplin MO Tornado Recovery. In the meantime, we are talking about blogging for business. One of the first posts in this series was about getting the URL right. That is important to re-visit because, if you don’t get that part right, none of the rest of your efforts will matter! Now let’s talk about platforms. First is a hosted WordPress blog. That means that you own the URL and host the blog yourself and it is on a WordPress platform. One of the greatest advantages of using WordPress, if you are just starting out, is that you can start with a blog and then grow it into a full blown website that has your blog built in. WordPress gives you a lot of flexibility for customizing your blog or you can pick out a ready-made theme and use that if you prefer. 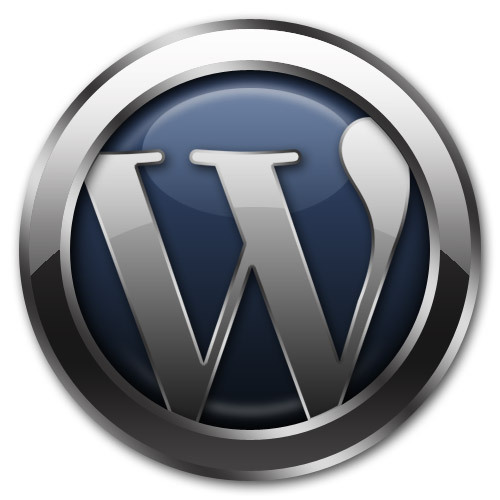 WordPress has plugins for just about any functionality you can imagine. Because it is open source, the WordPress community is always adding more and more plugins and functionality. Once your WordPress blog is set up, it is easy for you to use. If you can use a word processor like Word, you have the skills necessary to blog on WordPress. My second recommendation for a blog platform is HubSpot. HubSpot is a complete internet marketing software package that includes a great blogging platform. The great thing about the HubSpot platform is that it helps you write good blog posts as you go along. It checks, as you write, to make sure you are including your keywords. It will let you know if your post is not long enough or if it is too long. It will prompt you to do all the things you need to do to create great blog posts that will help your business. Of course, there are other advantages to using HubSpot. In addition to the blogging platform, the software offers you unbelievable analytics. You can follow those that visit your blog and website individually. There is a keyword grader included that helps you pick the best keywords for your business and will even suggest keywords for you. The HubSpot software will help you as you create offers for your business and include them on your blog and website by giving you an offer button creator and forms that will help you deliver coupons, white papers, ebooks and more from your blog. Certified HubSpot Partner in Arkansas! It’s official! Wharton Marketing is now a Certified HubSpot Partner in Arkansas. We have been through many, many hours of training and work learning more and more about inbound marketing and the HubSpot software. We will continue to stay true to our commitment to stay on the cutting edge of technologies and methods available for businesses to help them attract visitors and convert them into customers. “The fundamental way that people shop, learn, and buy has changed radically in the last few years. HubSpot helps transform the way businesses market from outbound marketing (cold calls, email blasts, and direct mail) to inbound marketing (Google, blogs, social media, mobile, etc. ),” said Brian Halligan, co-founder and CEO of HubSpot. HubSpot offers small, mid-size and enterprise businesses the first inbound marketing software-as-a-service platform that lets users take advantage of the changing nature of how products are bought and sold. 78% of Internet users conduct product research online. That means your website stands a good chance of being a prospect’s “first impression.” That also means your new business card isn’t a business card—it’s Google. 200 Million Americans have registered on the FTC’s “Do Not Call” list. That’s 2/3 of the country’s citizens. The other 1/3, I’m guessing, probably don’t have a home phone anymore. 91% of email users have unsubscribed from a company email they previously opted-in to. We’re getting savvier with technology and less patient with unwanted solicitations. And it’s just so easy to hit ‘delete’. 84% of 25-34 year-olds have left a favorite website because of intrusive or irrelevant advertising. Frankly, I’m surprised this stat doesn’t read “100%” and apply to a much wider age range. Inbound marketing costs 62% less per lead than traditional, outbound marketing. That’s right—62% less. The average outbound lead costs $373. The average inbound lead costs $143. And as we love to say around here, “if it don’t make dollars, it don’t make sense.” Outbound marketing just don’t make sense anymore. Wharton Marketing has been a value-added reseller for HubSpot for 4 months. Now we have kicked it up a notch to become Certified HubSpot Partners to better help businesses meet their online marketing goals. The fundamental way that people shop, learn, and buy has changed radically in the last few years. Wharton Marketing partnering with HubSpot gives us another tool to help businesses achieve their marketing goals. Learn more about HubSpot and contact us to see how to get started!